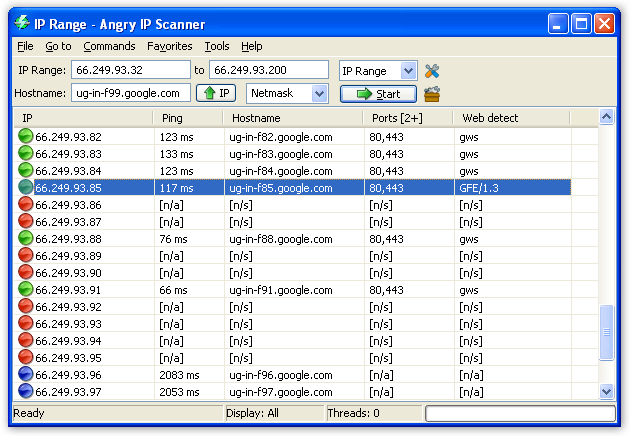 Angry IP Scanner is an open-source, cross-platform network scanner designed to be fast and simple to use. It scans IP addresses and ports as well as has many other features. It is widely used by network administrators and just curious users around the world, including large and small enterprises, banks, and government agencies. this IP Scanner is a fast IP address and port scanner, It can scan IP addresses in any range as well as any their ports. ...... It can scan IP addresses in any range as well as any their ports. It is cross-platform and lightweight. Not requiring any installations, it can be freely copied and used anywhere. Angry IP Scanner also has additional features, like NetBIOS information (computer name, workgroup name, and currently logged in Windows user), favorite IP address ranges, web server detection, customizable openers, etc. Qweas is providing links to Angry IP Scanner 3.0 as a courtesy, and makes no representations regarding Angry IP Scanner or any other applications or any information related thereto. Any questions, complaints or claims regarding this application Angry IP Scanner 3.0 must be directed to the appropriate software vendor. You may click the publisher link of Angry IP Scanner on the top of this page to get more details about the vendor.